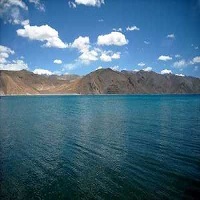 The famous and sparkling blue Pangong lake is situated near Leh-Ladakh in the Himalayas, approximately at the height of 4350 meters. This endorheic lake is 12 kilometres long and extends from India to Tibet, with two-thirds of it lying in the latter. Owing to its altitude, the temperature here ranges from -5Â°C to 10Â°C as a result of which the lake freezes completely during winters in spite of its salinity. A unique feature of the lake is that it does not remain blue throughout the year or even the day, rather it changes colours from azure to light blue to green and grey too! It has been a tourist attraction for a very long time and has gained further popularity after being a 'hot-spot' for many film shoots, apart from being an essential for anyone travelling to Leh - Ladakh. The sublime beauty, crystal waters and gentle hills of Pangong Lake are an exceptional example of the beautiful landscape of the region.